In 1966, officials from Manitoba Hydro, the Canadian federal government and the Manitoba government under Premier Duff Roblin signed a formal agreement to proceed with the Lake Winnipeg and Churchill River Diversion Project. This was an ambitious and expensive ($2.6 billion) program that would first divert the flow of the Churchill River into the Nelson River. 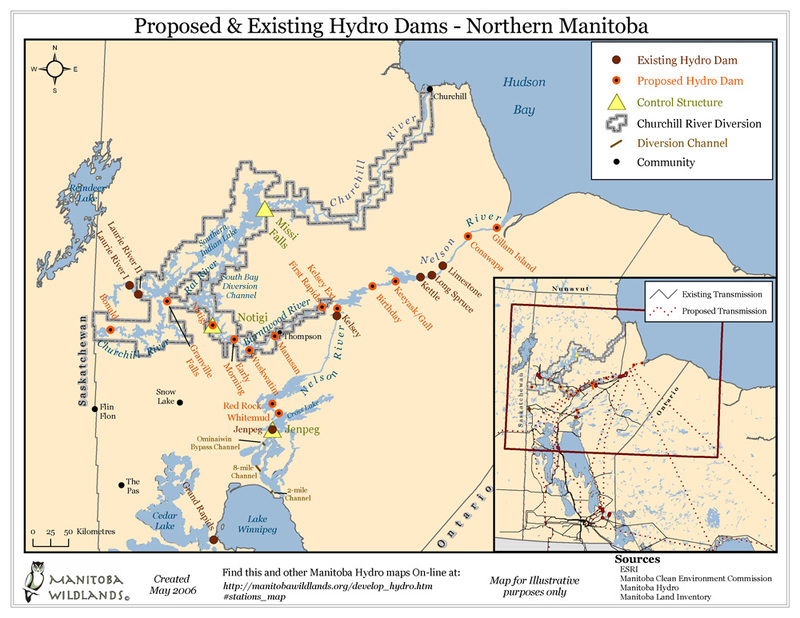 Further supported by a regulated escapement from Lake Winnipeg and associated "outlet lakes", the Nelson River would then have abundant and excessive potential for power generation upon demand. to develop a series of control dams, diversion channels and a generating station on the outlet lakes to further enhance and control flow into the Nelson River. The Canadian federal government would also meet the expense of building a 560 mile long transmission line to southern Manitoba. As well, and even with the low level diversion alternative in place, over 100,000 acres (40,470 ha) of shoreline were inundated directly, and many thousands of others affected by ancillary developments. The conception of the Churchill River Diversion project, as previously discussed, was part and parcel of a post World War II vision of economic prosperity through the exploitation of natural resources in northern Manitoba. Nowhere is the cost of the loss of the Churchill River calculated. Its existence, aesthetics, native community options, ecology, and unique role of creating a livable environment in an otherwise harsh land are considered to be worthless in the energy budget. For almost two decades there is sufficient Hydro-electric power ready to be developed on the already-committed Nelson River without touching the Churchill. The Nelson River power potential can meet Manitoba's needs until 1991. Consequently a study was carried out in the latter part of 1966 by the University of Manitoba (Duckworth Report) to outline the terms of reference for a major investigation of environmental, social and economic impacts of the high level diversion of the Churchill River system. Even before these studies could be initiated, however, this confidential report called for alternatives to the project, or at the least, a project redesign to minimize the effects of impoundment on Southern Indian Lake and the South Indian Lake community. From its very conception in 1966, it was known that the high level diversion project would necessitate a relocation of the entire South Indian Lake settlement. In the 1969 public hearings, therefore, considerable opposition resulted. This opposition came from Church, environmental and university groups who were concerned with disruption of the self-sufficient South Indian Lake community, the lack of impact assessment studies and the Manitoba government's refusal to publicly release its own internal reports on development. The new premier, Edward Schreyer, and his New Democratic government immediately reassured the South Indian Lake community and opponents of Churchill River diversion that the project would be subject to the closest scrutiny. To appease opponents of the project, two outspoken critics, Professors Cass Booy and Robert Newbury, were appointed to the Manitoba Water Commission to review plans and to continue holding public hearings. David Cass-Beggs was also appointed as a new general manager of Manitoba Hydro. For critics of the Churchill River diversion, the change in government seemed to indicate a change in philosophy regarding the north. On September 20th, 1970, Premier Schreyer announced that Churchill River diversion would proceed and, in November, Manitoba Hydro was granted the necessary water license. The Nelson House Indian band was not formally advised nor consulted about the impacts of the Churchill River diversion until the fall of 1973 - a full seven years after the first public announcement of Manitoba Hydro's intent. This was so in spite of the fact that this project would raise water levels in some areas as much 30 ft or more, inundating and otherwise altering reserve lands and traditional resource areas. Manitoba Wildlands - a non-profit environmental organization working for the future of Manitoba's lands, waters, and protected areas. Energy Manitoba provides information on all types of energy production and related issues in Manitoba, Canada, and beyond.